Staying in this Pigeon Forge log cabin is a FAMILY TRADITION everyone will look forward to! This beautifully appointed, 4 bedroom / 3 bath, luxury log cabin will make you want to revisit year after year. Conveniently located just outside Pigeon Forge in the Covered Bridge resort community, and with no mountain roads to drive on, FAMILY TRADITION is just a short drive back to Dollywood and the Cal Ripken Experience. Enter from level parking onto the wrap around porch with custom carvings into a vaulted great room with log rails and stone fireplace. 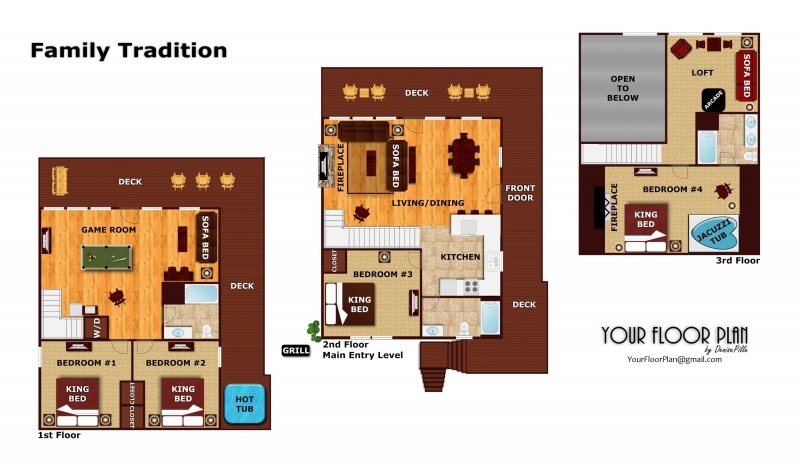 Guest can spread out on 3 levels of luxury living. Four separate King bedrooms, and a sleeper sofa on each level provide room for up to 14 guests to enjoy! Upstairs the kids will enjoy the multi-game arcade, and downstairs the game room with pool table and 70" LCD is perfect for kids young and old! Plan your Pigeon Forge getaway today and create a new FAMILY TRADITION to remember! Call today. It was a great weekend and the cabin was very nice and clean. Best vacation ever with my family!!! My kids did not want to leave and are already asking about our next vacation there!! It was very clean, spacious and easy to get to. I found the cabin to be clean and comfortable. Also, a plus was that it wasn't far from the parkway. My family really enjoyed their stay. Thank you. Family Tradition Cabin was wonderful! The layout was perfect for our get together with our family, ages 50 plus, teenagers and a 10 year old. The pool table, game room and two bedrooms that were all downstairs were perfect.... the kids could stay up all night without disturbing anyone else who was trying to sleep. The hot tub looked brand new, the kitchen was well stocked with utensils, pans, dishes, paper towels, dishwashing liquid. We loved the seclusion of the cabin and the neighborhood, but that it wasreally close to Pigeon Forge and Dollywood but not in the middle of all that crazy congestion and traffic. The stores at the end of the road ( jeep store, General Store and Pizza place) had everything we needed for our four night/five day stay. The GeneralStore was wonderful and the prices were very reasonable. The Pizza place had great thin crust pizza though the wait was really long but we just went back to the cabin as we waited. The Cabin was super clean, we loved all the flat screen TVS to watch hockey and football. Would definitely return! We came down for our wedding. The Family Traditions Cabin fit us all perfectly. We had a total of 13 people. We definitely want to start our family tradition by staying in this cabin on our yearly anniversary. Easy to find and the view was amazing. We will be back!!! The cabin we stayed in was beautiful. It was very clean and neat. I would definitely stay here again. This was our third annual cabin trip with our entire family. We stayed at Family Traditions. By far the best cabin we have ever stayed in. This was our first time renting from Pat and we will be back every year for sure. It was the cleanest we have everseen. They had EVERYTHING we needed and more. Our whole family loved it!! Thank you so much!!" Me & my family really enjoyed our stay at Family Tradition! The cabin exceeded our expectations! The pictures don't do it justice. There was more than enough room for all 12 of us-5 kids & 7 adults. Will consider it again when we return! Experience was amazing!!! Will plan another getaway in the future!!!!! The cabin was so beautiful!!! Wish I could have stayed in in forever!!!! We went to Gatlinburg to celebrate my husbands birthday. I had the help of an Agent at Patriot Getaway to help in choosing a cabin. The cabin is beautifully decorated and was large enough to accommodate 8 adults and 8 kids. What is very nice is the location. Had the mountain views, but not so far up making it difficult to go back and forth to town. Will definetly stay here again .